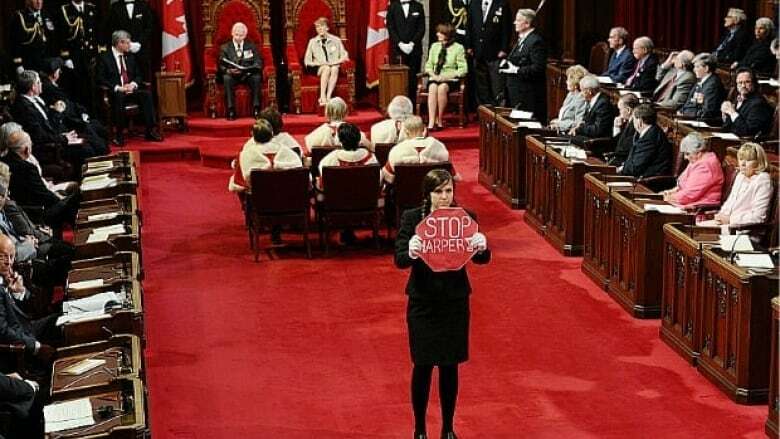 A 21-year-old page loses her job after walking onto the Senate floor during the speech from the throne to protest against Prime Minister Stephen Harper. A 21-year-old page lost her job Friday after walking onto the Senate floor during the speech from the throne to protest against Prime Minister Stephen Harper. Brigette DePape, a recent University of Ottawa graduate, carried a sign reading "Stop Harper" and walked out in front of Gov. Gen. David Johnston as he read the afternoon speech. Senate pages are hired for one to two years to work in the upper chamber, providing basic support to the senators during sittings and in committee meetings, which generally means fetching water, photocopying documents and passing messages. They tend to be politically engaged, but this type of protest is unprecedented. DePape went as far as to prepare a news release, which a friend distributed after she was removed from the Senate chamber by security. The release identified her as Brigette Marcelle, but the Senate website and her email address identify her as Brigette DePape. "Harper's agenda is disastrous for this country and for my generation," DePape said in the release. "We have to stop him from wasting billions on fighter jets, military bases, and corporate tax cuts while cutting social programs and destroying the climate. Most people in this country know what we need are green jobs, better medicare, and a healthy environment for future generations." The release said she was a page for a year but realized that working in that job "wouldn't stop Harper's agenda." "This country needs a Canadian version of an Arab Spring, a flowering of popular movements that demonstrate that real power to change things lies not with Harper but in the hands of the people, when we act together in our streets, neighbourhoods and workplaces." A release from Senate Speaker Noël Kinsella said the page's actions constituted a contempt of Parliament. "All employees of the Senate are expected to serve the institution in a non-partisan manner, with competence, excellence, efficiency and objectivity," Kinsella said. "The incident raises serious security concerns which the Senate will fully investigate." Kinsella's statement included an apology to Johnston. A spokeswoman for the Senate said DePape has been removed from her position. DePape's contract would have ended in three weeks when the Senate rises for the summer. Pages must be university students to hold the job. The Senate's page program website says DePape is from Winnipeg and studying international development and globalization. She interned last summer at the Manitoba office of the Canadian Centre for Policy Alternatives and wrote about travelling in a van with other activists to the G20 protests in Toronto last June. Mike Duffy, a Conservative senator, said "stunts" such as the one DePape pulled Friday hurt democracy, rather than further it. "These things are unfortunate because every time there's some kind of event like this it means security gets tightened," Duffy said. "And we want this to be the people's place, where people can come and talk to politicians and make their point, and so now who knows what the end result will be, but it will not be more relaxed security. It will mean tighter security. Liberal Sen. Jim Munson says everyone in the chamber seemed startled by the small protest. "The GG [Governor General) didn't flinch, and as senators we just kept looking at each saying, 'Did this really happen?'" Munson said. "It's probably one of the more exciting things I've seen in the Senate in a long time." Green Party Leader Elizabeth May said the protest was inappropriate and in the wrong place. "I sympathize enormously with youth in this country who feel they've been abandoned when the single greatest threat to their future isn't mentioned in the speech from the throne, and that, of course, is the climate crisis." DePape said Senate security decided not to press charges. P.O.V. : Do you support the Conservatives' agenda?